Here at BigFish Brand we are super pleased to find out this week that our BigFish Brand Smoked Salmon has been awarded a star in this year’s Great Taste Awards! Achieving a one star rating means that the Great Taste team have categorised the product as 'simply delicious.' Fewer than 25% Great Taste Award entries achieve win a one star rating. We launched Smoked Salmon last year - the first time we had introduced a smoked product to our BigFish range. It is made to our very own recipe here in Grimsby: traditionally cured, oak smoked and hand sliced. It very versatile: fantastic for canapés, in sandwiches or served up with eggs for an extra special breakfast. And of course, you can use it to add a delicious shot of flavour to cooked recipes, such as with pasta! 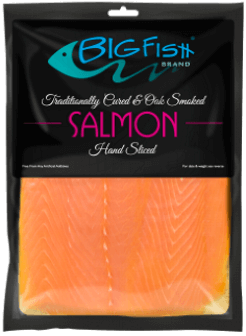 BigFish Brand Smoked Salmon is stocked by many of our independent stockists or you can order it online.